Emerson 40 HP 3 phase motor. 324T NEMA frame. 2-1/8" dia x 5-1/4" long keyed shaft. 1780 rpm. 230 / 460v, 3 phase, 60Hz, 92 / 46 amps, 40 HP. Ball bearing, continuous duty, enclosed fan, cast iron body. Typical applications include pumps, compressors. 94.1 efficiency. 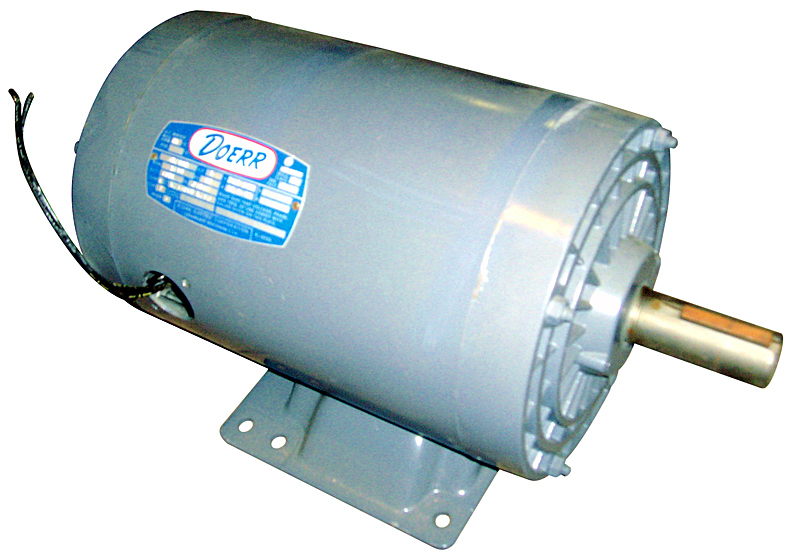 17" dia motor body, 24" overall width with electrical box, 24" overall length including shaft. Baldor motor. 213T frame. 1.373" x 3.89" keyed shaft. 1770 rpm. 208v, 3 phase, 23 / 10 amps, 60 Hz, 7-1/2 HP. Typical applications include pumps, fans, compressors, blowers and conveyors. 9-1/2" x 8" mount plate. Motor is 9-1/4" diameter x 14" long. Doerr AC induction motor. 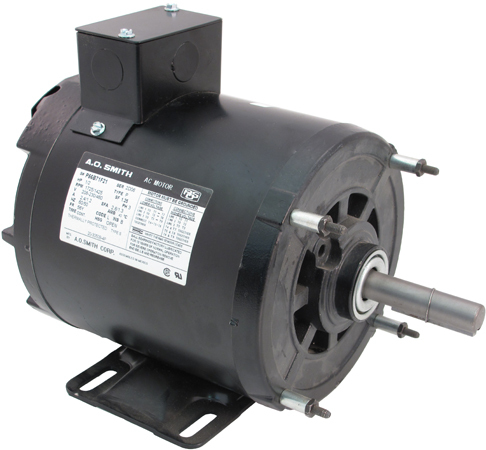 3 phase, 1800 rpm, 5 HP, 200/208v @ 60 Hz, 16.6/16 Amps. Ball bearings. NEMA 184T frame. 1-1/8" diameter x 4-1/2" long shaft. Originally made for Harris transmitter blower. Harris P/N: 430-0198-000. Brand new in the box!! Toshiba AC induction motor. 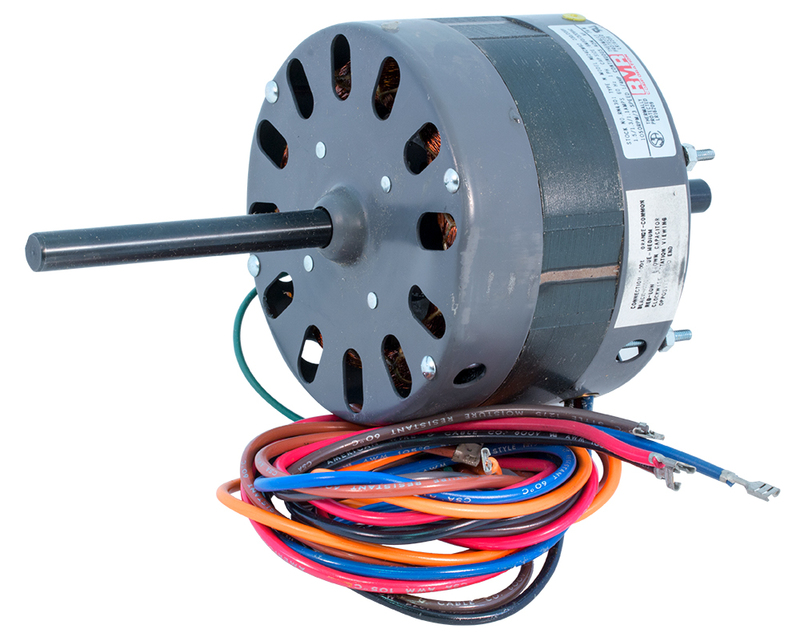 3 phase, 3470 rpm, 3 HP, 2 poles, 230 / 460v @ 7.8 / 3.9 amps, 208v @ 8.7 amps, 60 Hz. 145T frame. 0.875" diameter x 2-1/4" long shaft. 48 lbs. Originally made for Harris transmitter blower. Harris P/N: 432-0231-000. Brand new in the box!! A.O. 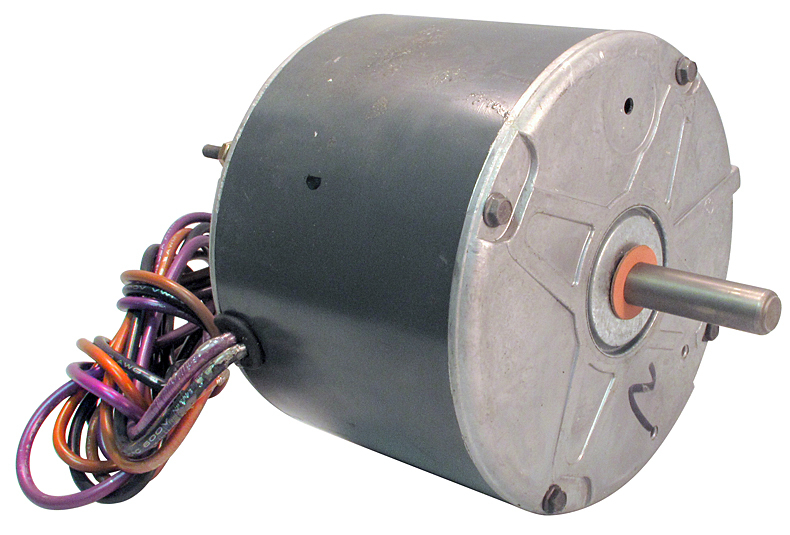 Smith AC motor for Genie. 3 phase, 1725 rpm, 3 HP, 208-230/460v, 60 Hz, 8.6-8.4/4.2 amps. TEFC enclosure. 56C frame. 3/4" Keyway shaft 2-1/4" L. Mounts by tapped holes in front head. A.O. Smith AC motor for Genie. 3 phase, 1725 rpm, 1 HP, 575v, 60 Hz. 56Y frame. 12 pin molex. Mounts by base or front studs. 5/8" flat shaft x 3" L.
A.O. Smith AC motor for Genie. 3 phase, 1725 rpm, 1 HP, 575v, 60 Hz. 1.4 amps. 56C frame. 12 pin molex. 1/2" Keyway shaft, 2-1/4" L. Mounts by front tapped holes. Reversible rotation. This is a "sample" motor and includes internal sensors. A.O. Smith AC motor for Genie. 3 phase, 1725 rpm, 1 HP, 208-230/460v, 60 Hz, 3.3-3.2/1.6 amps. 56C frame. 12 pin molex. 5/8" Keyway shaft x 2-1/4" L. Mounts by front thredded holes. Sample motor has internal sensors. A.O. Smith AC motor for Genie. 3 phase, 1725 rpm, 1 HP, 208-230/460v, 60 Hz, 3.3-3.2/1.6 amps. 56C frame. 12 pin molex. 5/8" Keyway shaft, 2" long. Mounts by front thredded holes in front plate. A.O. Smith AC motor. Made for a Liftmaster door opener. Ball bearings. 5/8" x 2-3/4"L v-keyed shaft. 56 frame. 1725 rpm. 115v / 208 - 230v, 1 phase, 14 / 7 amps, 60 Hz, 1 HP. Reversible. Base or face mount. Includes capacitor. P/N: C56B23F21. 6 month warranty. A.O. Smith AC motor for Genie. 1 phase, 1725 rpm, 115/230v, 11/5.5 amps, 3/4 HP. 56 frame. 5/8" Keyway shaft 2-3/8" L. Mounts by base or front studs. A.O. Smith AC motor for Genie. 1 phase, 1725 rpm, 1 HP, 115/208-230v, 60 Hz. 13/6.3-6.5 amps. 56Y frame type C. 12 pin molex connector. 5/8" flat shaft, 3" L. Reversible rotation. Mounts by base or front studs. Factory sample with internal sensors. RMR 3 speed motor. 1050 rpm, 1/4 HP. 1.5 amp, 60 Hz. 230v/208v. Perm. split cap. 5-5/8" diameter. 1/2"D shaft on each end. Requires 5 µF, 370v capacitor. Same as A.O. Smith RA1026. Magnetek motor. 140 / 940 rpm. 460 / 208 - 230v, 3 phase, 1.85 / 3.6 - 3.7 amps, 50/60 Hz, 1 HP. Frame M56Y. 5/8" x 2-3/4"L. Condensor fan duty. Goodman P/N: B176356-03. New and unused, but removed from equipment. 35lbs. A.O. Smith AC motor. Made for Liftmaster overhead doors. 5/8" x 2-3/8"L keyed shaft. 1725 - 1425 rpm, 208 - 230v / 460v, 3 phase, 2.6 / 1.3 amps, 50/60 Hz, 3/4 HP. 56Y frame. Reversible. Base or face mount. P/N: P56B72F21. 6 month warranty. A.O. Smith AC motor for Genie. 3 phase, 1725 rpm, 208 - 230v/460v, 3.2/1.6 amps, 60 Hz, 3/4 HP. 56 frame. 5/8" Keyway shaft 2-3/8" L. Sleeve bearings. Mounts by base or front studs. A.O. Smith AC motor. Made for Liftmaster door opener. 5/8" x 2/3/8"L keyed shaft. 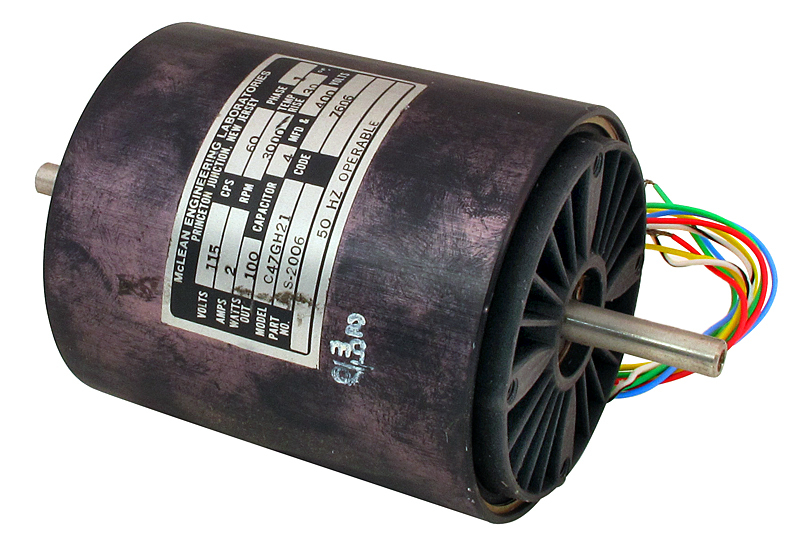 1725-1425 rpm, 208-230v / 460v, 3 phase, 2.4 / 1.2 amps, 50/60 Hz, 1/2 HP. 56Y frame. Reversible. Base or front mount. Ball bearings. P/N: P56B71F21. 6 month warranty. A.O. 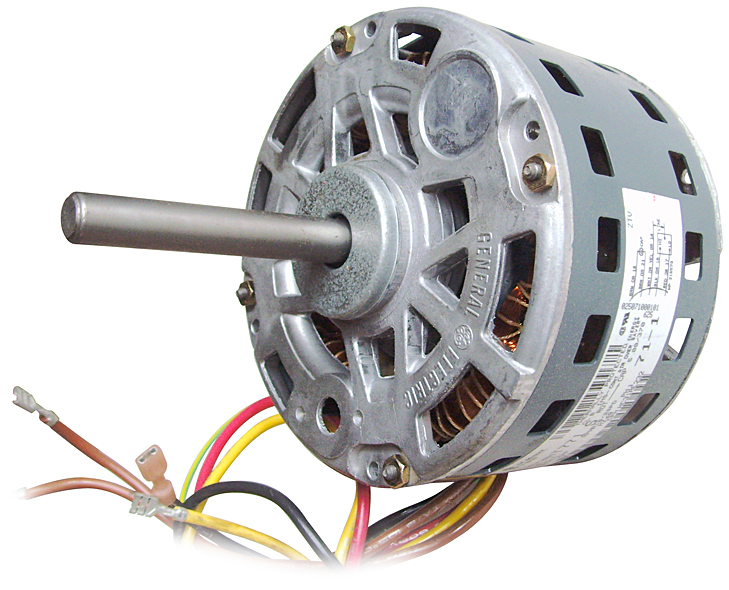 Smith AC motor for Genie. 3 phase, 1725 rpm, 208-230/460v, 2.8/1.4 amps, 60 Hz, 1/2 HP. 56 frame. 5/8" Keyway shaft, 2-3/8" L. Mounts by base or front studs. A.O. 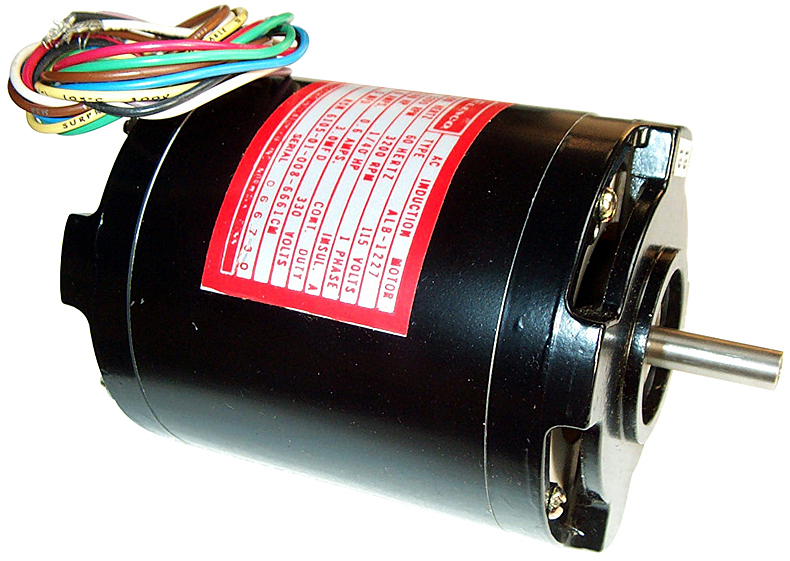 Smith AC motor for Genie. 3 phase, 1725 rpm, 208-230/460v, 2.4-2.5/1.25 amps, 60 Hz, 1/2 HP. 56Y frame. 5/8" flat shaft 3" L. 12 pin molex. Mounts by base or front studs. A.O. Smith AC motor for Genie. 3 phase, 1725 rpm, 208-230/460v, 2.2/1.1 amps, 60 Hz, 1/2 HP. 56C frame. 5/8" Keyway shaft 5-1/2" L. Mounts by front tapped holes. A.O. Smith AC motor for Genie. 3 phase, 1725/1425 rpm, 200-240/400-480v, 60/50 Hz, 1/2 HP. 56C frame. 5/8" Keyway shaft 2-1/4" L. Mounts by base or front studs. A.O. Smith AC motor for Genie. 3 phase, 1725 rpm, 575v, 1 amp, 60 Hz, 1/2 HP. 56C frame. 5/8" Keyway shaft 2-1/4" L. 12 pin molex. Mounts by front tapped holes. Special factory "sample" issue with extra internal sensors. A.O. Smith AC motor for Genie. 3 phase, 1725 rpm, 575v, 0.9 amp, 60 Hz, 1/2 HP. 56C frame. 5/8" Keyway shaft 5-1/2" L. Mounts by front 1/4" tapped holes. A.O. Smith AC motor for Genie. 3 phase, 1725 rpm, 575v, 1.4 amp, 60 Hz, 1/2 HP. 56 frame. 5/8" Keyway shaft 2-1/4" L. Sleeve bearings. Mounts by front studs or base. A.O. Smith AC motor for Genie. 3 phase, 1725 rpm, 575v, 1 amp, 60 Hz, 1/2 HP. 56Y frame. 5/8" flat shaft 3" L. 12 pin molex. Mounts by base or front studs. Marathon X221 motor. 48Y frame, CCWLE rotation. 1/2 HP, 208 - 230v AC, 60 Hz, 1 phase, 1075 rpm, 4.2 amp. 1/2"D x 6"L shaft. A.O. Smith AC Motor for Genie. 1 phase, 1250 rpm, 220v, 2.5 amps, 50 Hz. 42Y frame. 1/2" D x 3-3/4" L shaft. Reversible rotation. Sleeve bearings. Requires 20uF, 350v cap. A.O. Smith AC motor for Genie. 1 phase, 1725 rpm, 115/208-230v, 60 Hz, 1/2 HP. 48C Frame. 12 pin molex. Reversible rotation. 5/8" Keyway shaft x 2" L. Mounts by front tapped holes. A.O. 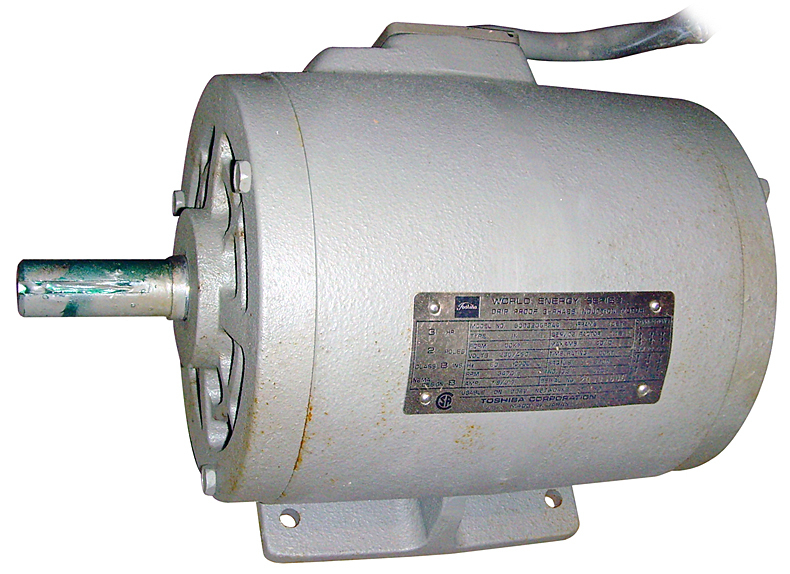 Smith AC motor for Genie. 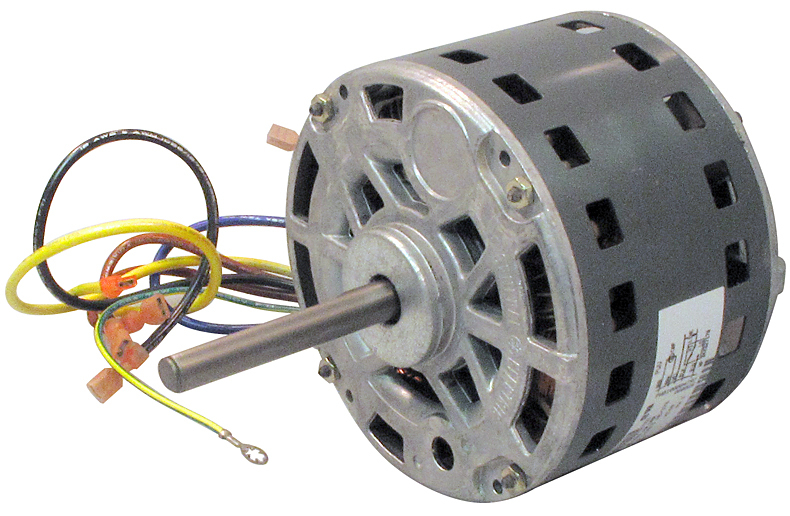 1 phase, 1725/1425 rpm, 115/208-230v, 9.0/4.5 amps, 60/50 Hz, 1/2 HP. 56C frame. Reversible rotation. 5/8" Keyway shaft x 5-1/2" L. Mounts by front tapped holes. 4.125" x 4.16" OC bolt pattern. A.O. Smith AC Motor for Genie. 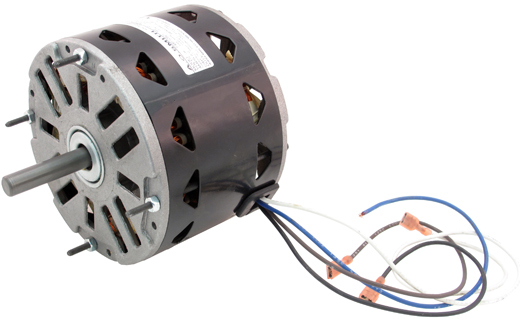 1 phase, 1725/1425 rpm rpm, 100-120/200-240v, 7.5/3.8 amps, 60/50 Hz, 1/2 HP. 56 frame. 5/8" Keyway shaft 2" L. Reversible rotation. Mounts by front tapped holes. A.O. Smith AC Motor for Genie. 1 phase, 1000 rpm, 240v, 3.1 amps, 60 Hz, 1/2 HP. 1/2" Keyway shaft 2-7/16" L. Reversible rotation. Front mount, 4 studs. 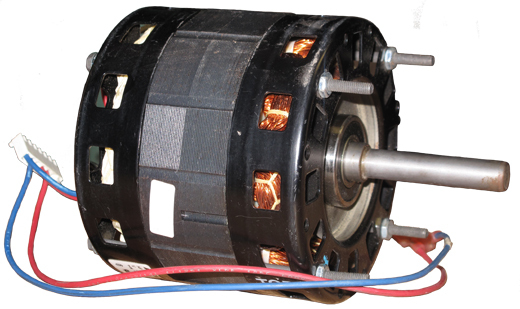 Elinco AC induction motor. 60Hz or 400Hz. 115v AC, 0.6 amp, 3200 rpm. Requires capacitor. 3-1/2"D x 4-1/2"L body, 5/16"D x 1" shaft. NSN: 6105-01-008-6661. A.O. Smith AC motor. Made for Liftmaster door opener. 1/2" x 2-3/8"L shaft. 48Y frame, 1000 rpm, 120v, 1 phase, 6 amps, 60 Hz, 1/2 HP. Requires 70 MF / 250v AC Capacitor. 3-5/8" c-c mounting studs. P/N: F48H24B-21. 6 month warranty. A.O. Smith AC motor. Made for Liftmaster door opener. 1/2" x 2"L shaft. 1000 rpm, 120v, 6 amps, 60 Hz, 1/2 HP. 48Y frame. Requires 70 MF / 250v capacitor. 3-5/8" c-c mounting studs. P/N: F48F10B21. 6 month warranty. 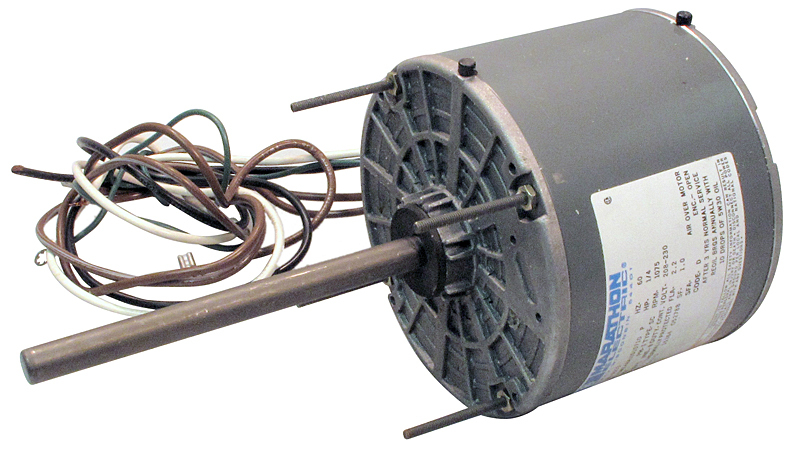 Franklin Electric AC motor. Frame 48. 115v, 1 phase, 60 Hz, 5.3 amp FLA, 1/3 HP, 1725 rpm. Thermally protected. Keyed shaft, stepped. 0.745" O.D., 0.668" O.D. and 0.554" O.D. with keyway. 2.6" overall length. Motor does not include shaft end bearing or end housing. OEM. Franklin pump application was pump that had built-in bearing. 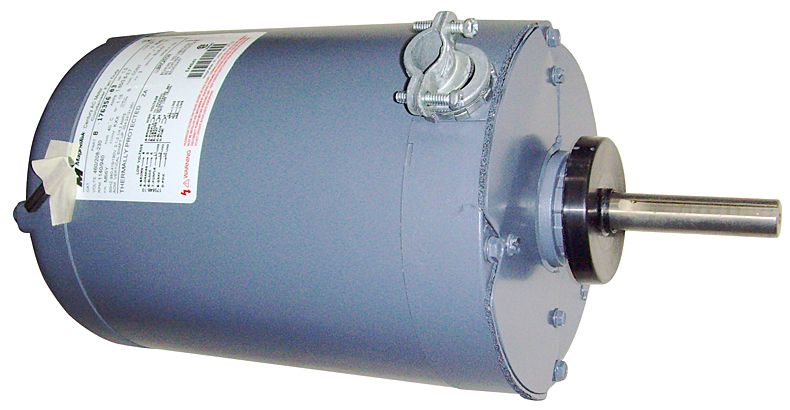 This open motor assembly bolted up to pump - completing motor assembly to operable condition. It is possible to construct end housing with 3/4" bearing for independent operation. Includes cooling fan impeller on rear with cover housing. 6" diameter x 7-1/2". Baldor motor. 1425 rpm. 110 / 220v AC 1 phase, 50 Hz, 4.6 / 2.3 amps. 48 frame. 1/2" x 1-1/2" long shaft. 7" outer diameter, 8" long. Marathon X213 motor. 48Y frame, sleeve bearings. 1/4 HP, 208 - 230v AC, 1 phase, 60 Hz, 2.2 amp. 1/2" x 6"L shaft. Mars blow motor. 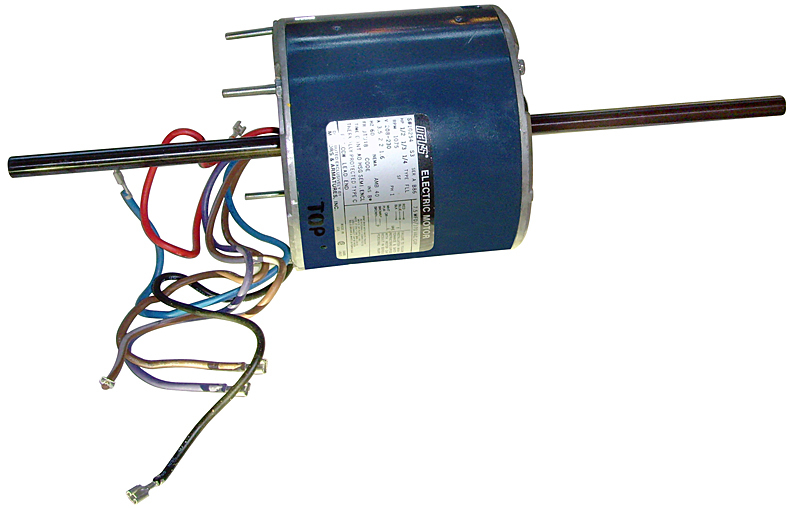 1075 rpm, 208 - 230v, 1 phase, 1/2 / 1/3 / 1/4 HP. Rotation: CCWLE. Dual shaft measures 1/2" x 6"L. Requires 7.5 µF capacitor. JTU48 frame. Mars blow motor. 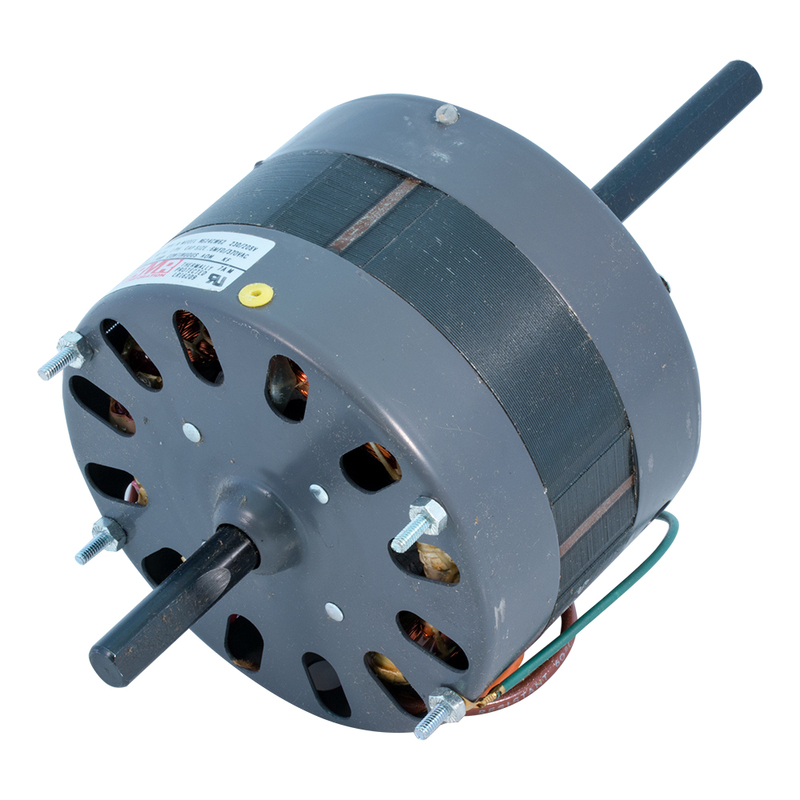 1075 rpm, 208 - 230v, 1 phase, 1/3, 1/4, 1/5 HP. Rotation: CCWLE. Dual shaft measures 1/2" x 6"L. JTU48 frame. General Electric motor. 825 rpm, 208 - 230v, 1 amp, 1/6 HP. Requires 5 µF, 370v capacitor. 1/2"D x 2"L shaft. Has a cut wire. Looks new but damage to mounting screws. Sold as-is. Goodman P/N: 10584308. Robbins & Meyers frame L241 type KP double shafted motor. 3450 / 2850 rpm. 208 / 220v AC, 50/60 Hz, 4.2 / 5.2 amps. 5/16" x 2-5/8" long shaft. 5" outer diameter, 6-1/2" long body. 5" x 4-3/8" mount plate. G.E. Electric motor. 3450 rpm, 1/10 HP, 115v AC, 1.25 amps, 60 cycle, 1 phase. 4" diameter x 5-1/2". 5/16"D x 1" "D" shaft. Continuous rating. Requires 7.5 µF capacitor. Motor blower. 48Y frame, sleeve bearing. 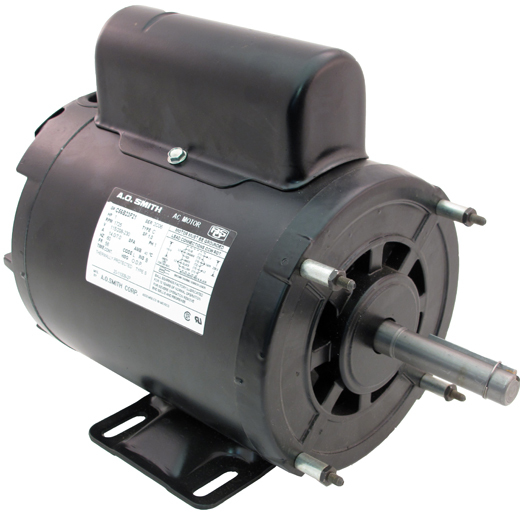 1/10 HP, 208 - 230v AC, 1 phase, 60 Hz, 900 rpm, 2 speed. 1/2"D x 2.5" shaft. General Electric motor. 800 rpm / 2 speed. 208 - 230v, 1 phase, 60 Hz, 0.7 amps. 1/12 HP. Rotation: CWFE. 1/2" x 3"L shaft. Frame 48. Sleeve bearings. 5-3/4" diameter. Requires 5µF capacitor. Goodman P/N: 1170644. General Electric 2 speed motor. 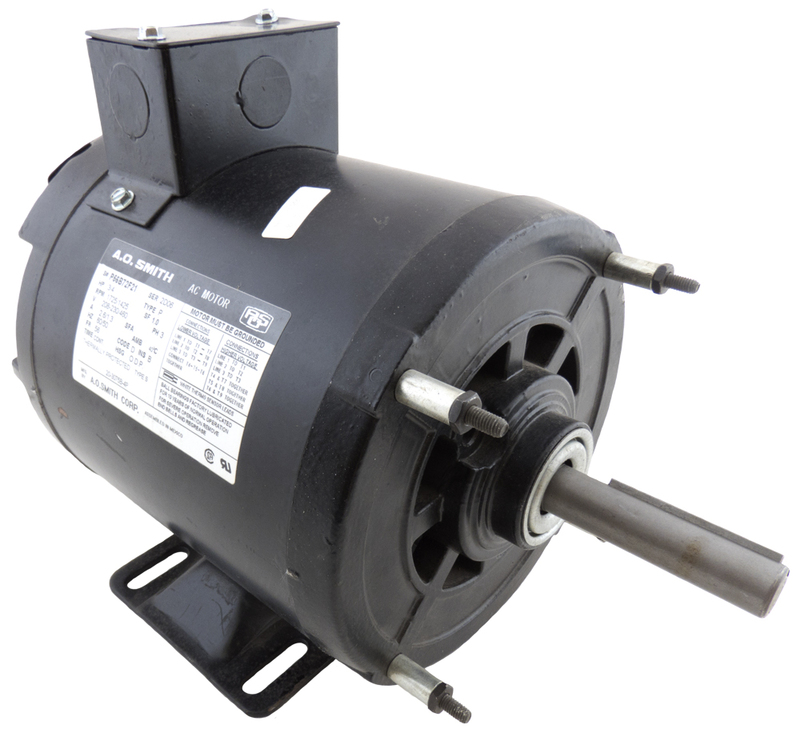 1/15 HP, 208 - 230v AC, 1 phase, 60 Hz, 850 / 750 rpm, 0.37 amp. Welded brackets. 1/2"D x 3" "D" shaft, dual. 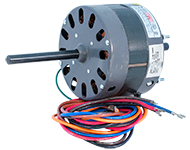 McClean 100 watt motor with dual 5/16" shaft is also reversible (by changing two wires). 3-1/2" diameter, 4-1/4" long. 115v AC, 2 amps, 50/60 Hz. 3000 rpm. Tapped heads for mounting. Requires 4 µF capacitor.